Provide the personalized service your clients deserve. These practice-tested forms are designed specifically for handling the special problems that arise in the representation of older clients. Each form is accompanied by practical, insightful commentary from Harry Margolis, telling you when and how each should be used. Many documents include a range of alternative clauses for common and not-so-common situations. ElderLaw Forms Manual saves hours of research and drafting time, simplifies information gathering, and gives you a competitive edge in this growing practice area. 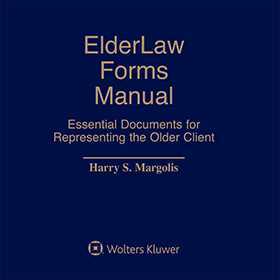 ElderLaw Forms Manual is featured in Elder Law Library on Cheetah.